Gutters. They’re part of a home that play a very important role but are often not thought about on a regular basis. 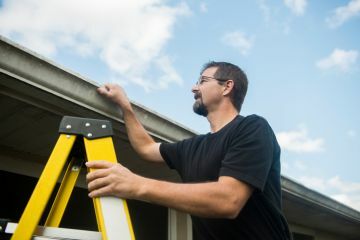 While it’s important for homeowners to provide regular maintenance to gutters, it’s usually the one thing that gets put off until it becomes an absolute necessity. The problem is that putting off gutter repair can create a lot of problems for your home. LYF Construction has 16 years of experience handling gutter repairs for local homes and commercial properties. Call (832) 304-6764 today for a free quote on repairing your gutters. Roof Leaks: A broken or damaged gutter can lead to water backing up in the gutter. Because it has no place else to go, this water will then overflow onto the roof. Too much sitting water in one part of your roof will likely wear down the shingles or roofing tiles. Once this water penetrates the area, you can rest assured you’ll experience a roof leak. Basement Leaks: The purpose of your gutters is to collect water and move it away from your home. However, broken or damaged gutters may not be doing their job properly. If water is overflowing, it could be sitting closer to the foundation of the house. This will result in pooling water, and this pooling water will create basement leaks that again could lead to more expensive and invasive fixes. Wood Rot: Standing water will cause rot, especially on wood. And since most homes are constructed of wood, standing water anywhere on the home due to poor gutters, such as around windows or doors, can create rot. This rot will lead to structural damage in more areas of the home that will require more time and more money to fix. Insects: When gutters aren’t working properly or if they’re not cleaned, you will notice leaves and debris piling up inside. Not only does this not allow water to flow through properly, but it also creates a breeding ground and comfortable home for insects. Landscape Damage: When water isn’t effectively moved away from your home and your gutters are overflowing, this excessive water could be falling onto your landscaping. Not only does this mean that plants and flowers are being destroyed, but too much heavy water could also do damage to landscape bricks and other aesthetics. Instead of putting off your gutter repair, contact the experts at LYF Construction. We’ve been in business since 2003, so we know how to repair your gutters properly. Contact us at (832) 304-6764 to schedule your appointment with us.